The all-new Ram 1500 impressed the audience with the radical improvements in all aspects when the model made the debut early this year. The arrival of the new-generation, half-ton Ram also paved the road for the redesigned heavy-duty versions which should follow with the 2020 model year launch. 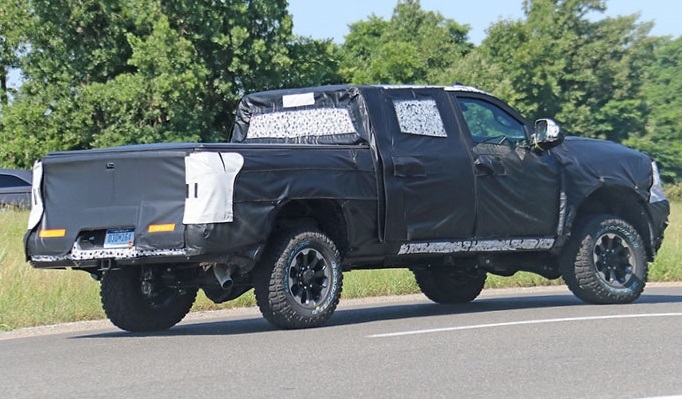 The heavy-towing trucks are testing wrapped in the thick camo ahead of the debut probably early next year and we already saw several prototype versions including the brawny, off-road-focused Ram Power Wagon. The new version of the off-road-ready Ram 2500 model rides on the rugged 33-inch tires and has lifted suspension which allows us to peek beneath. However, the details about the model’s mechanics still remain unknown ground in most aspects. The styling is also heavily disguised but the similar elements from the new Ram 1500 will surely find the way to the new generation heavy-duty Rams and Power Wagon. The interior will also follow the pattern of the smaller and better-selling Ram including also the tech features. The 2020 Ram Power Wagon will also arrive on the redesigned chassis and with the upgraded equipment which will boost both the performance and capability of the model. 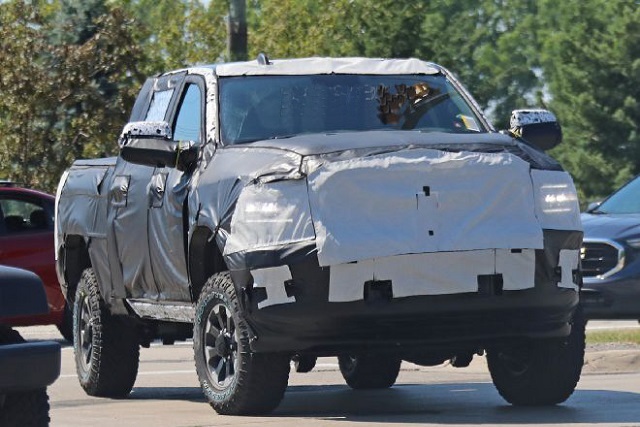 We won’t have exact details about the structural and styling improvements of the redesigned 2020 Ram Power Wagon before the official debut likely early next year. But as per the latest reports and expectations, the new heavy-towing Rams should follow the route of the all-new Ram 1500 and the Power Wagon version should not be the exclusion. The spy photos affirm also these expectations and some details are obvious. The new Power Wagon will switch to the new high-tensile steel treated chassis and could even gain the additional inches. The new structure will improve the capability but the mix of the light-weight materials should reduce the overall weight as well. The styling of the model should also mimic the smaller Ram Rebel version to the large extent. The rebel grille version combined with the new LED headlights will both look similar as on the smaller Ram. The model will also have the muscular hood and reshaped profile lines. To the brawny look will also add the off-road front bumper with the factory installed winch as well as the 33-inch Goodyear Wrangler DuraTracs tires. Beneath the model seems to have the solid axles front and rear. Inside the cabin, we should also expect the similar treatment as in the new-gen, half-ton Ram. Nicer materials and modern design will arrive with the new version and backed up by the newest tech features. The Power Wagon will again get the unique textures and contracting elements. The model will also offer the optional leather seats and add the latest infotainment system. The standard on the model should be the version with the 8.4-inch center display but the massive 12.0-inch touchscreen could be available as an option. FCA will also add new advanced safety systems but we will see which will be available with the off-road, heavy-duty Ram. The new and redesigned 2020 Ram Power Wagon will come with the serious off-road hardware combined with the lifted suspension and underbody protection for the vital components. The prototype version seems to have the similar suspension setup as the current version but there will be some upgrades on the elements combined with the strengthened chassis. The engine under the hood will likely remain a proven 6.4-liter V-8 Hemi. The engine lineup from the current generation, heavy-duty Ram should continue with the new iteration of the model but with the improved performance and efficiency technology. The V-8 Hemi now provides 450 hp and torque of 429 lb-ft working with the six-speed transmission. Many buyers would also like to get the Power Wagon model with the 6.7-liter Cummins turbodiesel I-6 engine but no proof Ram would offer it. The new-generation 2020 Ram Power Wagon should follow the debut of the heavy-duty Ram models expected in early 2019 Auto Show in Detroit. Close to that date, more details should appear as well as the effect of the upgrades on the price. The current Power Wagon goes for around $54k and the new version should stay close.